ABS Season 1: The Finale: Results! With 16 competitors, the Season 1 finale will certainly be a round to remember. With 95 creations built for this round, the judges had their work cut out for them. 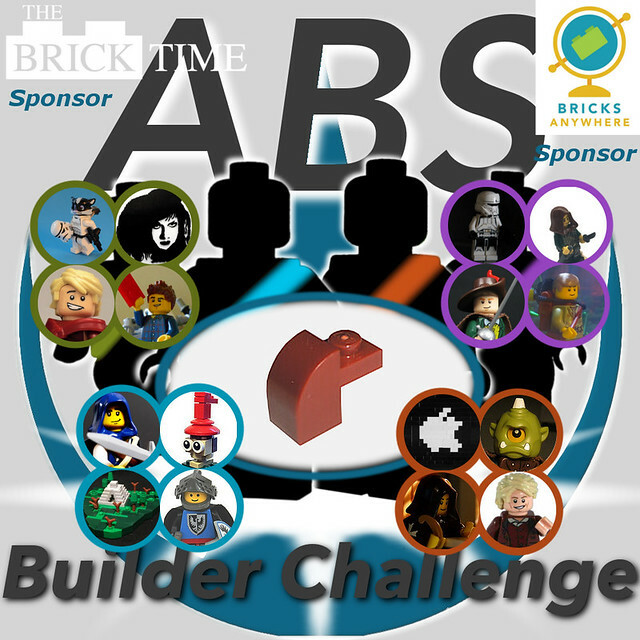 Thanks once again to our sponsors, Bricks Anywhere, and The Brick Time, who provided the parts for this round. In the end, the Corner House Azure Blue was hailed victorious! It was a narrow victory though, so keep reading to for the full scoring breakdown, some thoughts from the competitors themselves, and the announcement of the individual champion of the round. The champion of the round was decided by which contestant contributed most to their Corner House's score. John Snyder narrowly won this honor. Only the top contributor from each corner house is listed. Many of the contestants were able to share some background to one of their ABS Finale creations: how they thought of the idea, how the build came together, and more. Josiah N. - My favorite build was Ambushing the Helbrute. I got the idea when I was thinking about my brother. He is a Warhammer aficionado, and then I got the idea to build something from the "Chaos" subsection of the Space Marines. So from there I got advice from some good friends of mine, and they helped to develop the build into something excellent. I was going to originally keep the design free from the oozing flesh which it had, but I wanted to stay as true to the source materiel as possible. So making the oozing stuff look like a part of the build was really hard, but very rewarding. The idea for the round base came from Simon, and it was a last minute addition. Jen Spencer - I like building sci-fi interior scenes with wacky color palettes, so when I learned the seed piece was dark red, I immediately grabbed my container of dark red pieces to see what I had (not too much, honestly) and what other colors it might pair well with (I choose yellow) I built the three windows for a spaceship interior right away, but then I spent some time on my other entries for the contest and this scene just sorta stalled out. But after I picked up a copy of the LEGO Batman police pack, I had a breakthrough and decided to make the spaceship interior a murder scene. After that, the rest of the room easily fell into place. I tried to incorporate the seed piece into the scene as much as possible and had a lot of fun doing so. Id like to think that I came up with the chicken idea independent of anyone else, but someone may have put it in the team group. If I did think of it, I really dont know when. During the challenge, ideas would just come unexpectedly in the middle of the day. The first part of the chicken that I built was the head. I hadnt built many animals (comical or otherwise), so Im glad that the shaping came out as well as it did. From the head I worked my way to the bottom of the neck. For a while I was too lazy to build the body and just wanted to opt for a beheaded chicken, but eventually I decided to complete it. Probably the most interesting thing about this build is that most of the studs are facing down, beginning at the top of the neck. Roy of Florenheim - You know, I am honesty not sure how I came up with the idea for a Rock 'Em Sock 'Em Robots build. It might have been the shape of the seed element (its general shape reminded me of the iconic heads of the fighting bots, even though I never used it for the heads of my bots). Still, I'm not quite sure how the idea came about. While building it, I knew I wanted to have a working feature, and I pretty much knew exactly how I wanted to do it from the start. Unfortunately with the size I chose, I couldn't have working arms or the working head action, but at least having them move around and knock into each other got the point across. Compared to the actual game, my model (I feel) is very accurate to the real thing, incorporating the seed elements in a seamless way to get the accuracy I wanted. Overall I'm really happy with how the creation turned out, and I am always looking for a fellow LEGO builder to challenge me to a game! David Zambito - The shoe idea came late to me, but as I fiddled around with the basic size of it, I decided it would be a good scale for a giant. The feet and legs came together very quickly, and after I finished the skirt I was feeling good about just doing a waist down shot featuring a couple soldiers. Then I was cleaning up my building area so I could make a base and I picked the cow and was moving it over to where the rest of my Lego animals hang out, and the rest of the build came to mind. I spent a long 4 hours building a very flimsy body that I hated when I awoke the next day. So I spent another two hours rebuilding the body. And then another hour on the head after my wife talked about how much she didn't like it (this is where the teddy came in, thanks wifey!). I am happy with the finished product, especially since brick built figures are not my strong point. David Eldridge- The idea to build a merman came came from a couple places. I went to see the Little Mermaid musical at a school in my hometown, and the whole "Under the Sea" theme was swimming around in my head. A couple days went by and I began building the coral reef. I had planned to build a fish with the seed part and include it with the entry, but all the combinations I came up with looked disproportionate or simply too frightening too be a cute fish. I built the end of and tail and decided that, while to big to be part of the fish, it was the perfect start of a merman for a separate entry. Starting from the tail up I worked through a few different scales and kept switching back and forth between genders (as the original plan was to make a mermaid). The end of the tail that you see now is a different design than the one that started the build, and the proportions of the merman are not flawless, but I am content enough to call it an decent entry. This contest was challenging the first time around, and while I'd say that the first round's piece was a tad more infuriating, I had fun both times around and I look forward to the (most likely very far off) day I have the privilege of competing again. David Rajock - A lot of my ideas for the parts usage just came to me throughout the weeks. Sometimes the ideas came while thinking, and other times they came randomly. For this Ping-Pong build, I was just thinking about things in our house that were round and red. In our basement there is a ping-pong table that I pass each time I go to the LEGO area to build. Upon thinking about that, the paddles immediately came to mind and the idea ended up being quite perfect for both the color and the shape of the part. Thats also how the trolley build idea came about because I was thinking specifically about both the color and the piece shape. Obviously that method wouldnt work for every build, but it did help with a few uses this round. John Snyder - The nutcracker idea came around when I was thinking about what sort of real-life items were dark red, given the seed part color. Christmas items obviously fit quite well, and when combined with the shape of the seed part, I thought it would work nicely in several different spots on a nutcracker. However, I wasn't planning on building it very soon as there were several other ideas I liked better so I put it in the team group chat in case someone else wanted to try it. Then there was a local LUG event, which one of my teammates (Dave Zambito) would also be attending that gave me the idea of seeing if he was interested in doing a collab entry while there. He was, so we narrowed our build subject down to the nutcracker, and each brought a few boxes of parts that would hopefully be useful when building. The entire build came together in about 2 hours, though there definitely were some challenging sections. For example, neither of us had brought a lot of tan, so sculpting the face was rather tricky. Dave saved the day there, with his brilliant idea to use minifig legs when we were nearly out of the rest of our tan supply. Another of the more challenging sections were the legs once again though, Dave thought of a good solution, involving travis bricks and 1x2 tiles. I can't remember which of us thought of it, but we also were able to incorporate the seed part in black for the end of his boots, which finished the build off nicely. To look back at all the entries, visit the ABS flickr group. Thanks to our sponsors and all the competitors for putting on an incredible show, and congratulations to the Azure Blue Corner House, and John Snyder! We would love to hear your thoughts on this round, and the finale format, so leave a comment below.